Outdoor cooking differs substantially from interior kitchen-based cooking in many ways. The most obvious difference being the lack of an easily defined kitchen area, along with the way food is cooked. An outdoor kitchen allows the homeowner/chef to explore many additional styles of cooking that cannot be done within a traditional interior kitchen. Usually because it involves cooking the food in a manner that creates smoke and excessive heat. Enter the outdoor kitchen, this exterior kitchen enables homeowners to cook, grill, bake, and smoke like never before. Let’s face it, the last thing you would want to do is smoke a piece of meat for 8 hours inside your interior kitchen. It’s just not going to happen. The outdoor kitchen opens up a whole new world of cooking possibilities. Here at Elegant Outdoor Kitchens we manufacture custom outdoor living areas for homeowners that like to cook outside along with hosting social gatherings. 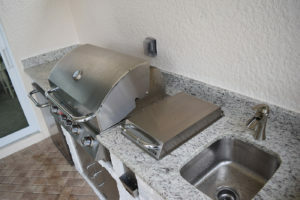 We work closely to develop professionals outdoor kitchens with built-in grills, pizza ovens, smokers, flat-top grills, sideburners, and many other features and functionality you would find in a traditional indoor kitchen. The outdoor kitchen is our way of returning to nature. Enjoying the outdoors while grilling as we have done since the beginning of time. Learn more by speaking with one of our design consultants today. Call now to schedule an on-site consultation with us.